So, finally I’ve had the time to kick off my long awaited home automation project – my excuse to play with the whole “Internet of Things” (IoT). In the long term I’d like to get my local school involved – bringing IoT to the community. 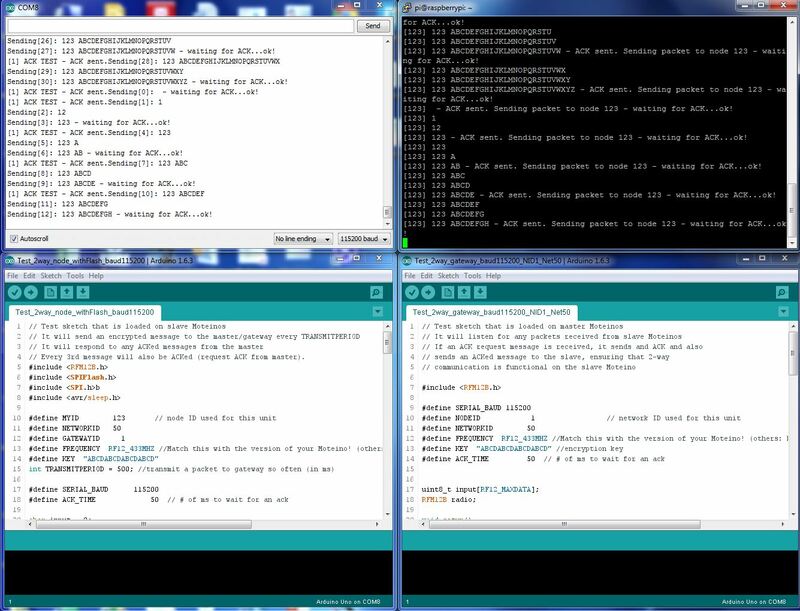 As my day job requires poking around with a lot of fun technologies, protocols and python (hacker not programmer) all in the name of datacentre automation (a.k.a. cloud computing to marketing folks out there) I’m going to leverage these skills to create a robust home automation ecosystem. DL360s and iLOs will be replaced with Raspberry Pis and Arduinos. If you’re wondering why I don’t just stick to WiFi for communications the answer is simply power and range! WiFi modules are power hungry in comparison to simpler RF devices. Not all devices to be linked to the internet will be near a power source so it will be necessary to run these from batteries – e.g. plant monitors, remote temperature sensors etc. Ultimately these battery devices will send their information to the internet through a gateway Raspberry Pi (RPi). The RPi will have both internet connectivity and RF connectivity. The first challenge that I had was to evaluate some low cost, ready made RF devices which included a couple of Moteinos (these are superb), from Felix at LowPowerLabs.com and the RFM12PiV2 from the OpenEnergyMonitor project. 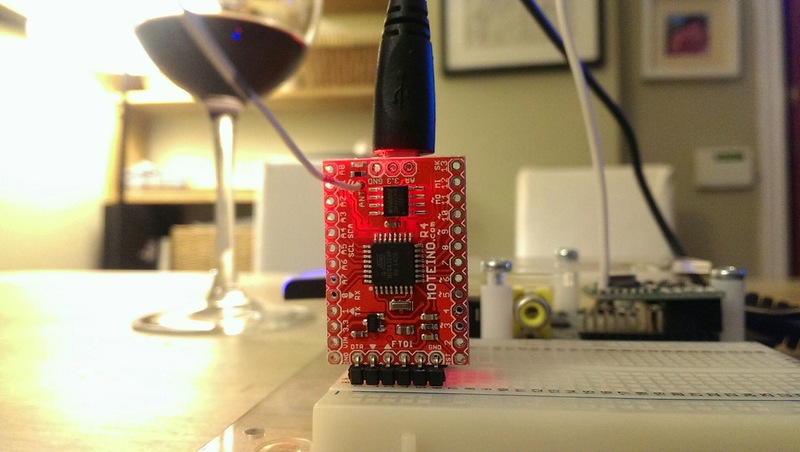 This device plugs into the Raspberry Pi and will be the gateway to the internet for all my RF based IOT devices. As I chose RF devices from two different projects they need some tweaks to get them talking correctly to each other and that’s what the rest of this blog will cover. What these devices both have in common is that they both use the Arduino compatible development platform based on the ATMega328 chip. As a result they can both be programmed using the Arduino IDE. The devices also have an integrated daughter board which contains the HopeRF RFM12B transceiver. 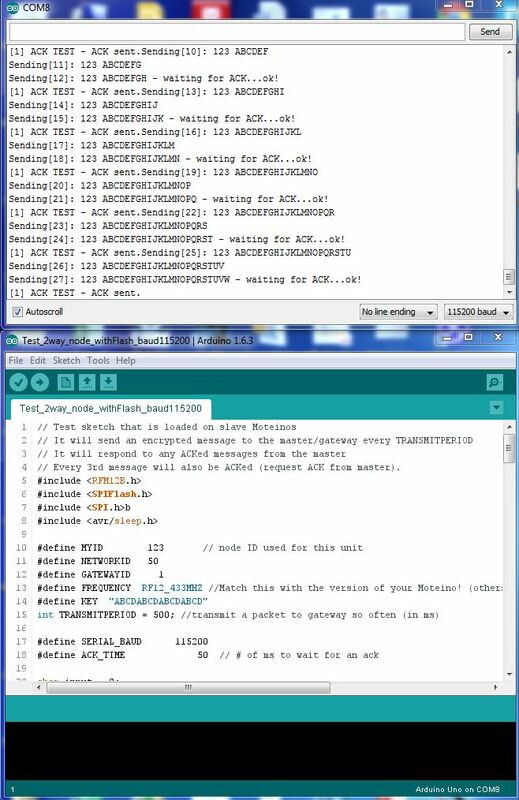 They differ in that they both run different programs (also known as sketches in the Arduino world) and their hardware clocks have also been architected slightly differently. The Moteino uses an external 16Mhz clock signal whereas the RFM12PiV2 uses the internal 8Mhz clock that is built into the ATMega328. This last piece of information is vital when syncing transmission between the devices. // Every 3rd message will also be ACKed (request ACK from master). 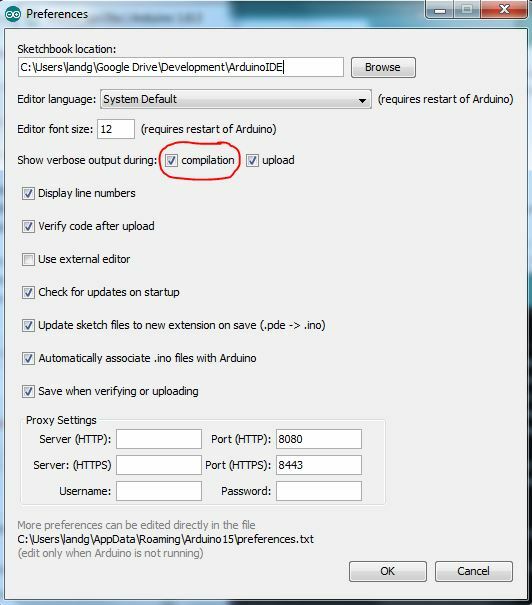 This is straight forward by connecting the Moteino directly to a PC running the Arduino IDE and use the standard Arduino process. These devices also have a very useful wireless programming capability which is covered here. This process is a little bit trickier. 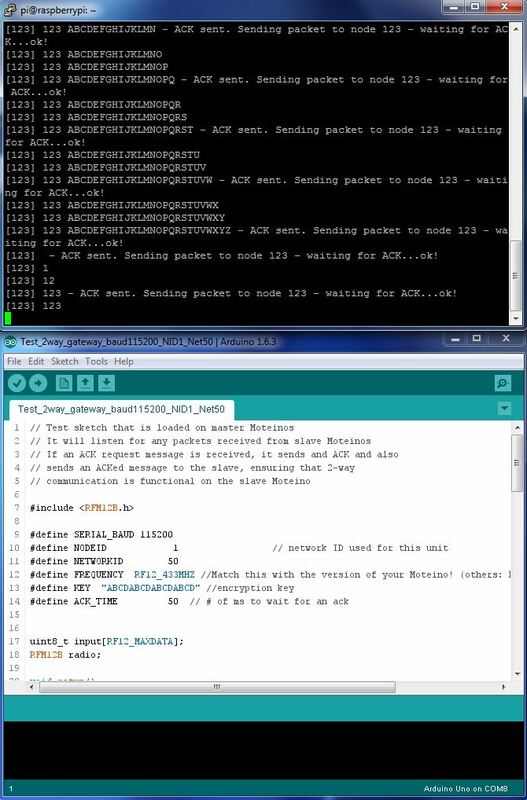 We need to compile the gateway sketch using the Arduino IDE first and then locate the compiled bin file. Now when you compile the sketch the output window will give you the location of the compiled file that you will need to transfer to the Raspberry Pi. 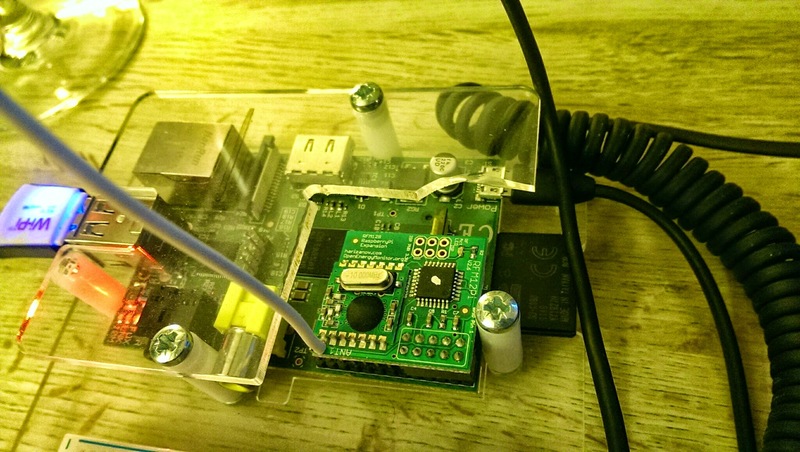 Ensure that the serial port on the Raspberry Pi has been enabled as detailed here. Finally, use your tool of choice to read the serial port on the Raspberry Pi – I’ve opted for screen. In the long run I’ll use a python script. NOTE Remember that difference in clock speeds – that comes into play now. 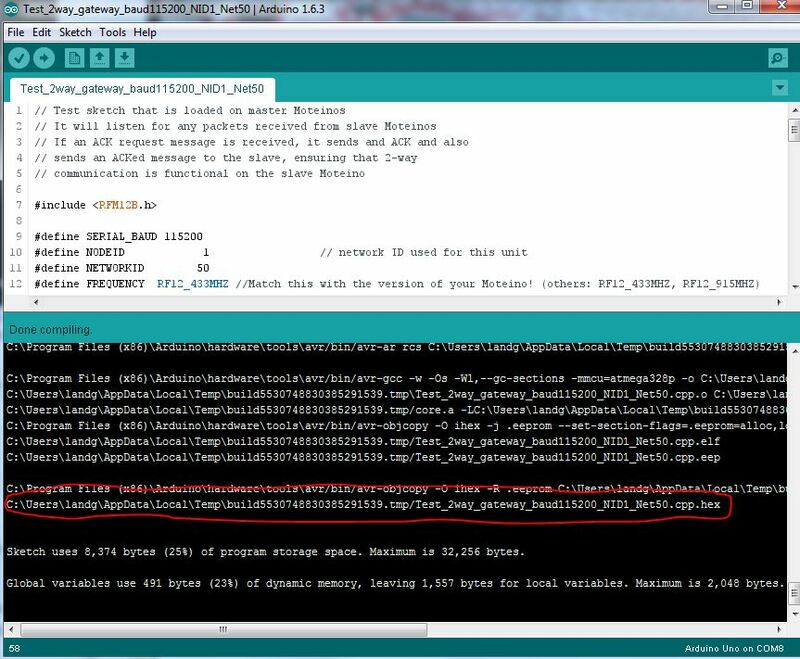 Despite the sketches both setting the baud rate to 115200, when connecting to the RFM12PiV2 which is running at half the clock speed, 8MHz instead of 16MHz, it is necessary to set the baud rate to 57600 and NOT 115200. Putting it all together will give you a working Moteino to RFM12PiV2 base communication system. ← SSH from Linux works but Putty from Windows fails – Go Figure…well I did!